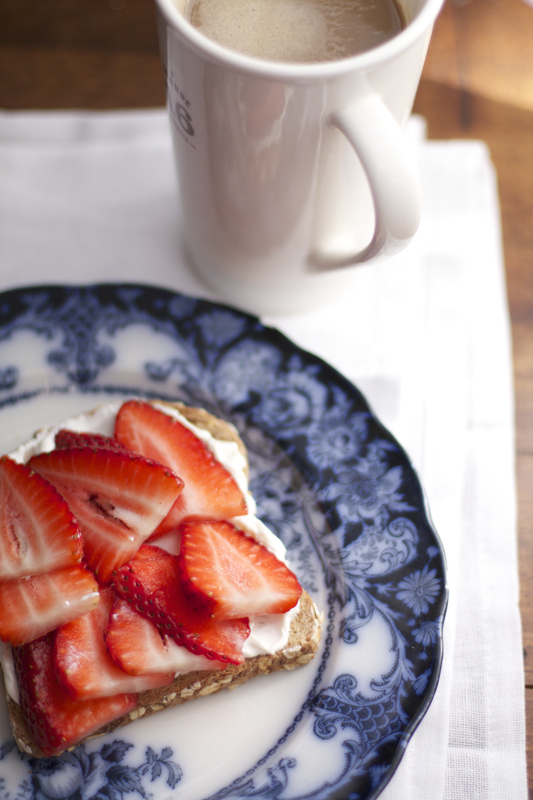 Kefir cheese with a bit of honey and sliced strawberries on sprouted grain toast. For most of my life, my morning routine involved waking to an alarm set to sound well before the the sun had even thought about sending its rays to brighten the black horizon outside my window. I was ready for work in less than forty minutes and shuffling out the front door with my coffee in hand, satchel thrown over one shoulder and purse over the other. There was rarely a thought for breakfast of any kind unless I remembered to grab a cup of yogurt I could eat in the car — not the safest decision one can make. Although I no longer have that routine, the habit of not eating breakfast has stayed with me and I’ve had to work to remember to eat before 9am each day. I’m rarely hungry first thing in the morning, and once I’ve had coffee, that seems to delay any hunger pangs that remind me to eat. I get busy with my day and then don’t think about eating until I look at a clock and realize it’s nearly noon. I’m famished by that time so reach for something with little or no thought. A portion much too large. Something — anything with some nice rib-sticking carbs. Two pieces of toast with butter and maybe some jam or honey for added flavor. A cup and a half to two cups of cereal. A piece of left-over cake or pie. Perhaps another of the muffins I’d baked the day before. Left-over white rice with warm milk, butter, cinnamon, and sugar. Lots and lots of carbs. I will admit the toast was always whole wheat or multi-grain and the cereal the likes of Raisin Bran or Wheaties. And thankfully there wasn’t always cake or pie sitting around, but I think you get the idea. Clearly, I needed to make some adjustments with the first being to actually eat breakfast early in the morning instead of at lunchtime. Next, I needed to make sure there were better options available. That meant I had to spend more time thinking about what to put in the cart when I was at the market. Sounds like a lot of work, doesn’t it? It’s not. It’s become routine in the last couple of months and I’ve noticed the more I stick with it, the more ideas I get. Variety seems to be the key for me because I’ll stay interested. Otherwise, I’m afraid I’ll ease back into my old habit of skipping breakfast. What do you eat breakfast every day? 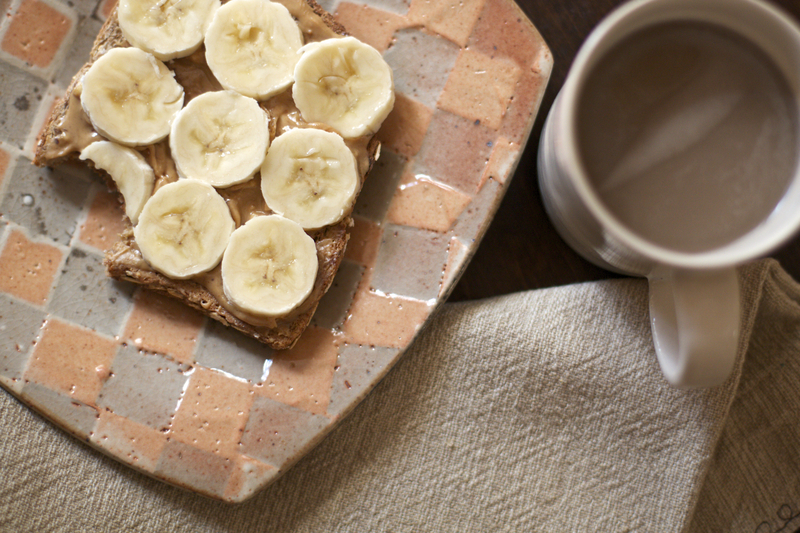 Half a banana with chunky peanut butter on sprouted grain toast. Sweet peppers and onions sauteed in a dab of olive oil, two eggs over easy sprinkled with an herby seasoning and some Parmesan. 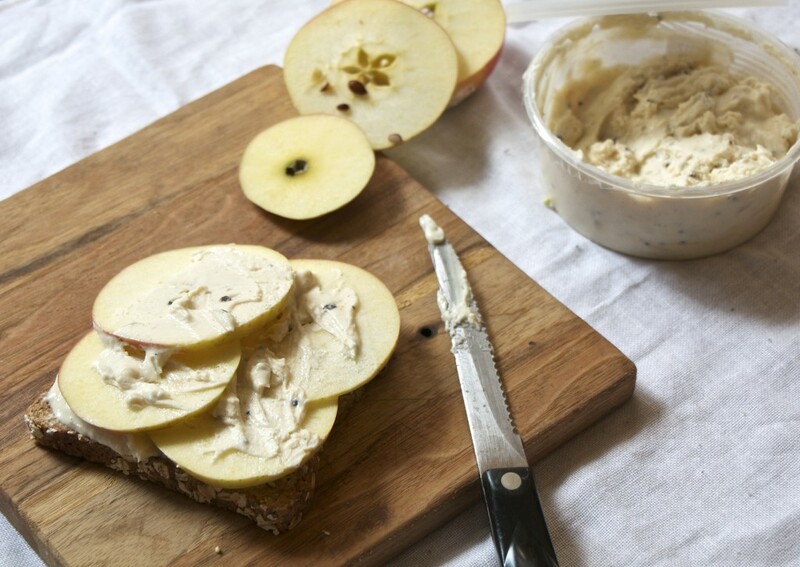 Vanilla Bean Quark with apple slices on sprouted grain toast. 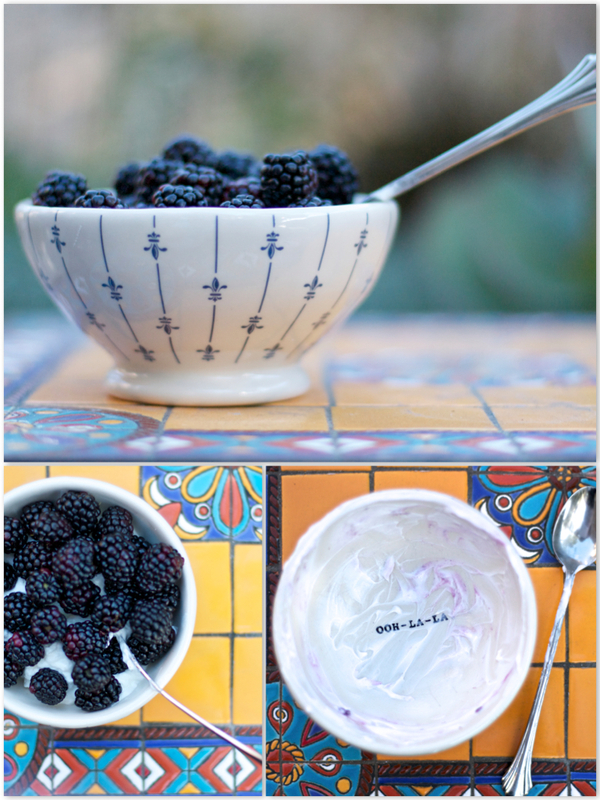 One cup of blackberries — or any berries — with a cup of non-fat plain Greek yogurt. At first I had to drizzle it with a bit of honey or agave nectar, but not any more. I mash the berries up and stir it all around before I dig in. 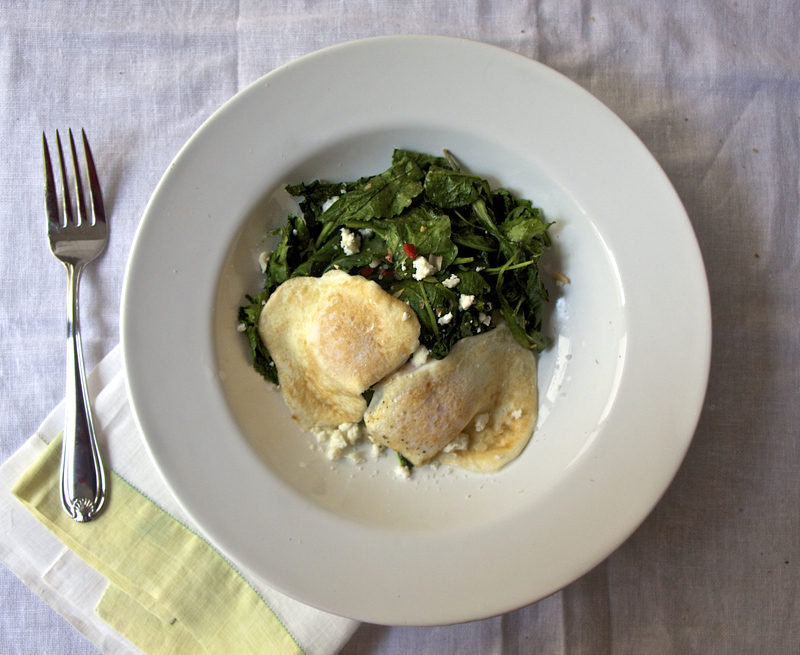 Kale or spinach sauteed with a bit of garlic and red pepper, two eggs over easy with a sprinkle of homemade goat’s cheese. It changes, but generally it contains two handfuls of ice cubes, a cup of Greek yogurt, a cup of berries, a half banana, a good sprinkle of ground flaxseed, and a few glugs of sparkling flavored mineral water. The greens aren’t always there. It depends on what else is in the meal plan for the day. Sometimes I use an apple instead of the berries. Occasionally an orange or tangerine. 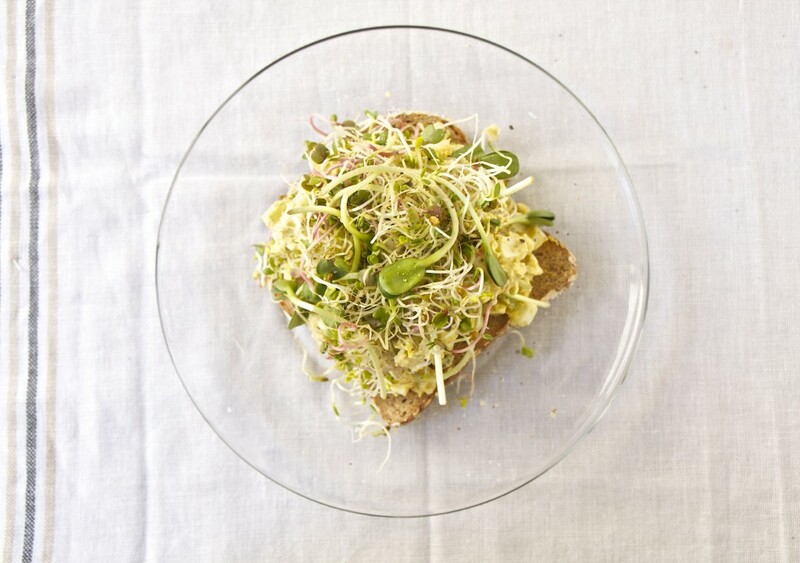 Curried egg salad with mixed sprouts on sprouted grain toast. The egg salad is a mix and match of many recipes I’ve tried but is made with kefir cheese instead of mayo. There are apples in it, pecans, celery, and onions. Make it ahead and it’s in the fridge ready for breakfast like this, or for lunch wrapped in lettuce. Delicious! Breakfast Salad with homegrown salad greens, roasted asparagus and sun-dried tomatoes. Now I know there are registered dieticians out there who might wag a finger at me, but I think this is a pretty good round up of my breakfast choices on most days. Do I want a donut? Most of the time, no, because they’re just not my thing. A hot cinnamon roll, then? Well, of course. And I’ll have cinnamon rolls again — just not now. Mmm…cinnamon rolls. Where’s the muffins? I have tried a few muffin recipes that are decent and full of good things — like these Zucchini Carrot Muffins, but I’m not quite there with including them at this point. Soon. Once a week, maybe. What you don’t see here is the cereal I eat. It’s usually a multi-grain blend. I like Kashi cereals quite a bit but have also found that Nature’s Path Organic cereals are really good. Small bowl, 3/4 cup of cereal, 1% milk (I haven’t quite gotten to the non-fat milk stage even though I like the non-fat yogurt) and half a cup of fruit. I love oatmeal, but rarely fix it for myself. When I do, I like it with apples and nuts — and when I’m feeling like a treat, then Irish Porridge is so tasty. I’m not a peanut butter lover, so that particular combo is all about the combination of what is on that slice of toast. Think body fuel and you’ve got it right. Peanut butter can have quite a bit of sugar in it, so I do look at labels and measure it — 2 tablespoons is too much for me. Kefir cheese is like cream cheese, but more tangy. It’s great for your guts even if you’re lactose intolerant and pretty low in calories. I use it for all kinds of things when I need creaminess — like that curried egg salad up there. It can be a bit thick, but is easily lightened with a bit of plain yogurt. It’s great in this Banana Caramel Nut Frozen Yogurt! The smoothies are an acquired taste. The banana is a sweetener and although I do make them without it, I don’t enjoy it as much. When I make a batch, I usually get two very large glasses out of it and am always sorry when I’ve reached the bottom of the glass. 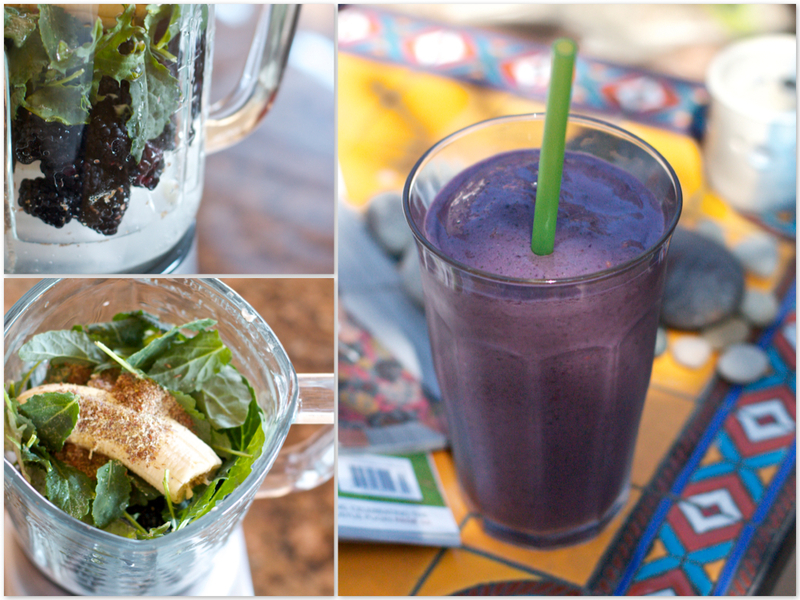 I love my smoothies. I’ve tried many brands of Greek yogurt and prefer Fage over all the others. Plain, zero fat and lots of protein. Your intestinal tract will thank you. It looks like I eat eggs every day, doesn’t it? I don’t, but when I do, I always eat two and always try to eat them with some vegetables whether they’re scrambled, poaches, or fried. Speaking of frying — the ScanPan I have requires no fat to fry and isn’t coated with Teflon which can be very unhealthy. It’s got a ceramic finish instead and works like a dream. I’ve been eating Ezekiel Sprouted Grain Bread because I’ve been trying to find a good way to get bread back into my diet. I’ve been looking for and sampling recipes to make at home, and until I find one I like, then this will do. 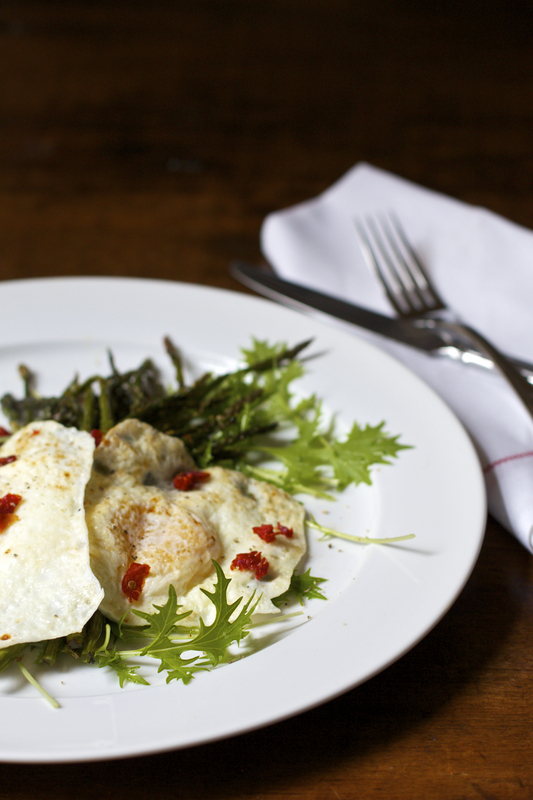 Like the eggs in the egg salad, the asparagus can be made ahead and used when you need it. I love asparagus with eggs. A squeeze of fresh lemon over it is a lovely finishing touch. If you’re thinking life is too hectic in the morning to consider any of this, my hubster fixes his own breakfast and packs a lunch and snacks before he heads to work in the morning. Again, I make sure the right things are in the house for him so it’s easy. He likes oatmeal or a multi-grain hot cereal in the morning with a bit of milk and uses the microwave to make it. He eats yogurt, too, but likes the flavored variety. Sometimes he scrambles a couple of eggs. Yes, he eats in the car, but hey — he’s not eating junk! 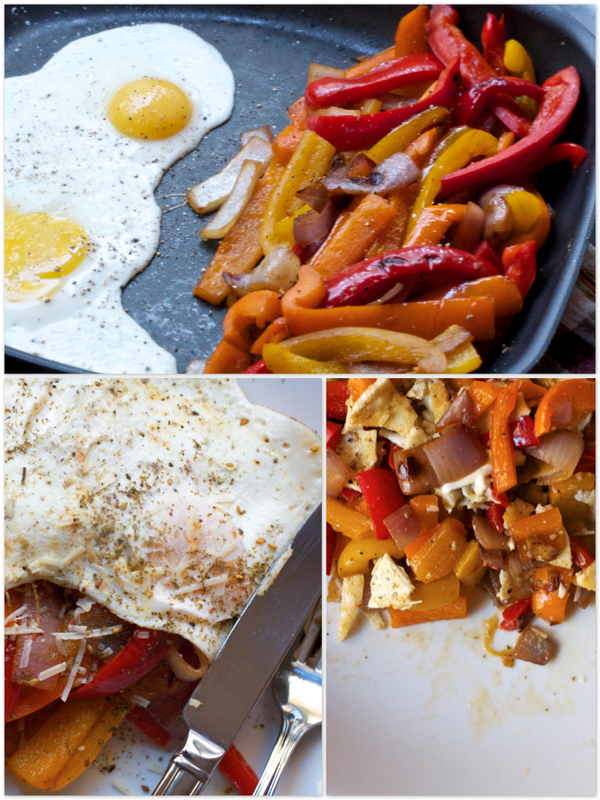 If you more ideas for rethinking breakfast, by all means, send them my way! More and more there’s a fine line between breakfast and lunch, so anything goes. 16 lbs. lost as of today with 19 days to make it 18 which is my goal of 6 lbs. a month, but I’m thinking 20 lbs. is more in order. I’m only 4 lbs. away. Can I make it?